While we have had some local, national and global tragedies, hardships and overall weirdness this year, 2017 has been a fantastic year for Chubby Dog Farm. It has been a year of growth and learning, winning and waiting. We are reading many posts and articles about good riddance 2017, but we feel a bit differently. That being said, we are not those people who are constantly saying how "blessed" we are. We are not glass-half-full eternal optimists, painting only rosy pictures of our lives to save face. We are realists. And the reality is that farmers live on hope. Hope for favorable weather. Hope for good genetics. Hope for equipment to function, materials to last, fences to hold. Hope for good product. Hope for good customers. Hope for word to spread. Hope to grow and thrive. Chubby Dog Farm has grown and thrived in 2017. We didn't know how we were going to sell our first litter of pigs, but with the help of culinary events Cochon555 and Chefs for Farmers, and visionary chefs like Chef Matt McCallister of FT33 Dallas, we sold out. We now have a solid customer base to build on, and we are thankful to all of our customers, whether chefs or individuals. We want our pork to be available and accessible to anyone, and we are working to streamline our program to be able to give the best possible price while still making as much as the meat processors make. We are looking forward to 2018, excited about the possibilities. We hope to provide a pig to two Texas Cochon555 events. We hope to get pigs to more restaurants in Houston, Dallas, Austin and San Antonio, and all places in between. We would love to have more individuals come to visit the farm and go "shopping" in our walk-in freezer or stock their freezer with a whole or half pig. It feels nice to have a stocked freezer, and even better knowing that the meat is not only delicious, but raised well, free from the horribleness of factory farms. We'll be celebrating the new year quietly here at home after preparing for the hard freeze coming our way. While we're looking at pictures of our new grand babies, eating some happy meat and drinking craft beers, we hope you have a fun and safe celebration. Come visit the farm sometime. Happy New Year to everyone! The summer has been incredibly busy... and hot. Being native Texans, we KNOW summers are hot, but I think we forget HOW hot. And we always seem to have ALL THA PROJECTS scheduled for June and July. We are finally getting to a place where we can relax a bit on the weekends with friends schedule to visit. And we love farm visits! 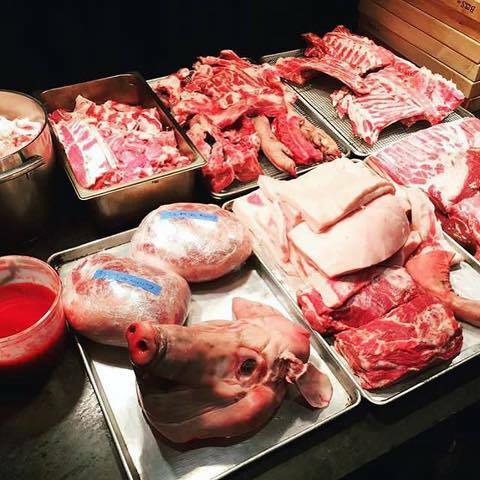 My last blog was about Chef Hori of Kata Robata winning Cochon555 Houston with our wattle-litsa pig, an event that may have put us on the map. People are talking about us. They say things. Our Instagram followers have more than doubled, and our CDF Facebook likes are over 300 now. I dabble on Twitter. Keep talking, folks. We'd love to be a local household name. One wattle-litsa from our first litter remains that is claimed by a chef in Dallas. Three tamworth-litsas are ready for the butcher, with one (or a half) requested by a like-minded custom butcher in Dallas who heard of us by word of mouth. Our younger wattle-litsas will be ready in October/November, and we hope to provide one to Chef Hori again for Grand Cochon in Chicago, as well as another local farm-to-table festival in Dallas this fall. In addition to our mangalitsa red wattle crosses, we have added two hereford sows to our program, Dumplin' and Gnocchi, and eight red wattle piglets from The Barry Farm. Dumplin' now has five week-old full blooded piglets, and we're considering keeping one of the two males for breeding stock. Our aim is to diversify so we're not only providing beautiful fatty mangalitsa-crossed pigs, but leaner, faster growing heritage pigs as well. This past winter with our inaugural litter, we were worried that we made a horrible mistake by feeding expensive non-GMO/non-soy feed having no customer base and limited funds. We knew that there were hoards of people out there with our same mindset. We simply needed to find them. Well, we found some of those people. Business has been good. We are developing relationships with chefs and butchers and families who want quality meat. We couldn't be happier! So... we will keep doing what we are doing, feeding the best ingredients that we can find, expanding fences, rotating paddocks, and raising our animals naturally, as pigs, goats, and chickens should be raised. Our red wattle sows will have another litter in the late summer, and our goats will kid in November. Our February-born wattle-litsas will be ready for the butcher this fall. We have a walk-in freezer with USDA inspected pork cuts available for sale, with a 15% discount for 10 pounds or more. Contact us if you are interested in some pork cuts, a pig, a goat, some eggs, or if you'd simply like to come visit the farm. Life is good here at Chubby Dog Farm. Chubby Dog Farm's Pig... Cochon555 Houston 2017 Winner! Chubby Dog Farm's inaugural wattle-litsa litter and culinary debut was a victory! The amazing Chef Hori of Houston's Kata Robata worked magic with our pig and won the Cochon555 2017 Houston competition. "Cochon555 is a nose-to-tail competition dedicated to supporting family farmers and educating chefs and diners about the agricultural importance of utilizing Old World livestock. We work with every type of restaurant and bar imaginable – Mom-and-Pop, farm-to-table, BBQ, Michelin star – and our participating chefs all share one core value: they source products responsibly. Our epic 2017 culinary tour starts in New York City and culminates with the finale, Grand Cochon." We were incredibly honored to be a part of Cochon555. Calvin happened upon a Facebook post on Ritual's page about the event. He went to the website, filled out an application to submit a pig, and within a couple of days, we were in. A week before the event, we delivered the pig to the butcher, and then delivered it to Chef Hori at Kata Robata the following day. He treated us to an incredible lunch where we were treated like VIP's. So the micro vacation was scheduled. Two nights at The Lancaster, dinner with friends on Saturday at Pass & Provisions, and Cochon555 Sunday... a fantastic culinary weekend. We knew that we were the underdogs, being a new farm, but we were going to ride the wave anyway and enjoy our true introduction to the culinary-meets-farm world... and our first vacation in over 4 years. The event was decadent. Wine, spirits and food were overflowing at every turn. Although we could not judge, we were honored to witness the judging of each chef's offerings. Watching the expressions and hearing the audible moans was a treat in and of itself. Chef Hori showed such respect for our pig during his presentation to the judges that we felt respected as the farmers. Now it was our turn. The bites were luscious. Chef Felix's noodle soup, Chef Luis' chorizo grilled cheese, Chef Monica's sisig... oh the liver!, and Chef Bobby's al pastor on the turntable! But... let's have a little chit chat about Chef Hori's bites. The curry rice. The miso marinated collar. THE SHUMAI (dumpling)! Best bite of the day! For two sometimes isolated, introverted farmers, having support from several of our friends attending the event was a big deal. We were so glad they could be there to experience the day with us. We spent the rest of the afternoon feasting and imbibing and mixed with farmers, chefs, foodies, event coordinators, and sommeliers. The weather was a bit of a challenge for this indoor/outdoor event, but the rain had cleared enough for us to enjoy the last hour or so outside. As Brady Lowe introduced the chefs, the thunder began to roll. The winner was about to be announced, and all I could think was that we were simply happy to be there. Then as if in a dream, I hear "Chef Hori of Kata Robata with a wattle-litsa from Chubby Dog Farm!" The tears came uncontrollably. All of the hard work and sacrifice, dirt and sweat, love for the animals and butchering of those animals... it was all rewarded in that single moment. Hugs. Photo ops. More hugs. We celebrated for a few minutes, as the weather gods gave us that. Then the skies opened up. We, as small farmers, are thankful for events such as Cochon555. We will stay true to our vision of ethically raised animals, even when people balk at our prices. We won't get rich being small farmers, but "we can care for our food from conception to table, feeling morally justified in eating every day, as well as improving the flavor for us and our neighbors", as in our mission statement. Spring seemed to come early this year, and everything is green and blooming and growing like mad, including our pigs that are finally ready for the butcher and their younger siblings. We delivered five customers' pigs to the custom butcher a couple of weeks ago, and we are anxious for them to pick up their pork and give it a try. We have learned so much this first go round and are open to different butchering options to make it easier on the customer. Last week, we met with Bill's Meat Market, a USDA Federally Inspected processing plant in Carthage, TX who will be processing five more of our pigs so we can sell individual cuts to the general public. The people there were extremely professional and helpful, and they took the time to sit down with us and discuss their process and answer all of our questions. The individual cuts will be more expensive than the price for a whole pig due to the USDA inspection requirement. Our artisan pork was fed premium GMO-free feeds with no hormones or antibiotics. They were raised in their natural habitat. The sows do not give birth in farrowing pens on concrete. They build intricate nests in the woods to protect themselves and their babies and have an incredible mothering instinct. They roll in mud holes and root around for tubers. They scratch their bottoms on trees and go for long walkabouts. They yawn and lie around in the shade. They are robust and content and healthy. In addition to the individual cuts of pork, we have eight more whole pigs available now. You can purchase a whole pig, or we can certainly work with you if you coordinate with friends and family to split a pig in half or quarters. Let us know if you are interested or have any questions. Our artisan pork cuts will be available early this summer at the farmers market or directly from the farm. We are buying a large walk-in freezer for the barn and a large generator in case of a power outage... constantly improving and upgrading. Prepare to stock your freezers with an extraordinary quality of meat, and take home some fresh eggs and goat milk soap. Watch for the date of availability, and come visit with your coolers and wallets. Bring a friend. My favorite season, ahead of even Christmas, is kidding season! Nothing makes people smile more than happy, hopping baby goats. Our Windy and Sannah kidded two weeks ago, and we are happy to present our four beautiful kids, Erik the Red and Afrikan Rose, Magnus and Maddie Annah. These babies grow so quickly. They're already eating feed with momma twice a day in addition to nursing... and are strong and thriving. Both moms are excellent second time mothers, and they are taking exceptional care of their kids. We are looking forward to breeding the younger girls this summer to our beautiful savanna buck, Bruno Mars. Our aim is to breed an east Texas hardy meat breed, and Bruno is a step in the right direction. PORK IS THE WORD. Our pigs will be ready for the butcher by mid to late March. They are eating us out of house and home, and they get bigger right before our very eyes... good for the end customer. These beautiful pigs are happy and healthy, and they are being fed Texas Natural Feeds, a non-GMO/non-soy feed. We are offering WHOLE pigs for $5.50 per pound based on hanging weight, which includes delivery to butcher within 50 miles of Grapeland and butchered/packaged. We hope to be partnering with local urban restaurants to showcase our meat on their farm to table type menus. Let us know if you are interested in a whole or half pig. Our sows, Maple and Paté, are heavily bred, and any day now, they'll be giving birth to their second litters of mangalitsa-red wattle piglets. We hope that we can partner with enough restaurants and families to continue feeding Texas Natural Feeds, but if that is not the case, we will at minimum raise some hella happy pigs on conventional feed to be offered at a more conventional price. YOU tell US what you want. We can make it happen. Give us your feedback on your pork or soap needs. Or simply tell us how cute our goats are. Thank you for following us!